Outerwear attire is worn over other garments and is generally designed to protect wearers from inclement weather or other adverse environmental conditions, although some outerwear is primarily ceremonial in function. Humans have worn outerwear garments since prehistoric times, but the word "outerwear" has been in use only since the early twentieth century as a general term for this type of clothing. Any garment worn over the day, evening, or work attire of a given period is technically an outerwear garment, with styles ranging from simple shawl-like drapes to jumpsuits that cover the entire body. Fashionable outerwear, however, does not include protective work garments, so this entry focuses only on those outerwear styles worn with regular day or evening clothes. Although there is no definitive evidence, it seems probable that the first outerwear garments were fur skins used as final body wrap. By the late Paleolithic period (c. 40,000 B.C.E. ), skins were being cut and sewn together using bone needles and thread made of animal hair or ligaments. The first sewn outer garments were probably fur capes, designed to fit over the shoulders. This assumption is supported by the existence of wooden "toggle" pieces discovered in European graves of the Magdalenean period (15,000-8,000 B.C.E. ), positioned to act as the front closures for a garment worn over the shoulders. In outerwear intended for warmth, the fur was worn next to the body, whereas if the garment's function was primarily ceremonial, the fur was worn outside, as in the leopard skins seen much later in depictions of Egyptian priests of the eighteenth dynasty (1580-1350 B.C.E.). Just as wraps of fur had done in the earliest societies, lengths of cloth draped or wrapped around the body served as outerwear garments in the early Middle Eastern, Egyptian, Greek, and Roman civilizations. In Greece, both men and women draped a length of fabric called a himation over their tunics. Soldiers wore a short cape called a chlamys, made from a fabric rectangle wrapped around the left arm, and clasped by pins at the right shoulder, leaving the edges open along the right arm. In Rome, the himation became the pallium, and semicircular as well as rectangular fabric pieces were used for capes, as in the paenula, which also had a hood. Another ancient outer garment was a poncho-type cape, in which a slit was cut as an opening for the head; the Roman version was called a casula. As noted, capes-sleeveless garments hanging from the shoulders-date back to prehistory with various styles developing over time. In European countries, from the time of Christ to the eighteenth century, capes, cloaks, or mantles-the words are generally used interchangeably- were the primary outerwear garments for both sexes and for all ages and economic classes. These garments were variations on the forms worn since antiquity, and of different lengths and styles depending on the era and/or their wearers' rank. For example, wealthy people wore capes lined and trimmed with fur both for extra warmth and as a status symbol. Outerwear garments were also sometimes worn indoors as well as outside, for added protection against the cold in unheated buildings. Ceremonial outerwear, robes of state, and robes for chivalric orders were impressive mantles made of luxurious fabrics and furs. Occasionally, new garments came into fashion that were part of stylish daywear with an outerwear character, such as the coat-like over-gowns worn by aristocratic men and women in the fifteenth and sixteenth centuries. The men's gown developed from the long gowns worn by men in the Middle Ages and, by the 1490s, versions were being worn over the new short doublets. The gown was open in front to show the doublet and was typically sleeveless or with short sleeves to reveal the doublet's sleeves. Portraits of Henry VIII from the 1530s show him wearing flaring, knee-length examples over elaborately slashed doublets. Like the male version, the women's over-gown was usually open in the front and sleeveless or with short sleeves so that the under-gown and its sleeves would show from beneath. The women's style was worn in the third quarter of the sixteenth century and originated from the Spanish ropa, which itself may have had Oriental origins. Because these gowns were part of current fashion, they were not outerwear in the same sense as capes. The gowns certainly provided additional warmth for their wearers, but, unlike capes, did not afford overall protection from the elements. For men, the gowns went out of fashion by the 1570s and for women by the 1580s. Modern fashion trends toward complex clothing styles and rapid style changes, which were set in motion during the Renaissance, did not affect outerwear to any extent until much later. The most significant changes for outerwear took place during the eighteenth and nineteenth centuries, with sleeved coats and jackets slowly superseding capes as the primary outerwear garments for both men and women. In men's fashion, this progression begins in the late seventeenth century with a new outerwear garment, the greatcoat, also called a surtout. The origins of the greatcoat are unclear, but it is generally thought that it developed from workingmen's clothing, possibly the hongerline, an overcoat worn by French coachmen in the late 1600s. It was the English, however, who popularized the greatcoat, obscuring its working-class beginnings and tailoring it into a fashionable garment. Greatcoats were worn over men's suits and were cut fuller, looser, and longer than the suit coats they covered. Over the century, as suit coats lost fullness in their skirts and sleeves, so too did greatcoats become more streamlined in cut. By mid-century, greatcoats had also acquired their most distinctive feature-tiers of two or three wide cape-like collars. Although many men still wore cloaks, greatcoats had definitely become the more stylish outerwear option by 1800. Informal short outercoats, or jackets, were the other important development in men's outerwear in the eighteenth century. These garments, which had many style variations, also originated from working-class clothing and resembled sleeved waistcoats. Because of their obvious working-class associations, jackets did not become popular among the upper classes until the century's end. By the 1790s, however, fashionable young men were wearing jackets for hunting. One such style was the spencer, probably named after George John Spencer, second Earl of Spencer, who first sported one of the fitted, waist-length jackets. Women's outerwear coats and jackets have their roots in the seventeenth century, when women first adopted elements of male dress for riding. In the late 1600s and early 1700s, the style of women's riding habit coats and waistcoats were taken directly from men's suit coats and waistcoats, except that the women's garments were cut to go over full skirts instead of breeches. At the beginning of the eighteenth century, women's riding coats were slightly above knee-length and when open, revealed a waistcoat of almost equal length. By mid-century, riding coats had shortened to about hip length, becoming fitted jackets, and riding habits were regarded as outerwear suitable for both riding and traveling. Women also wore a variety of jacket-style bodices for informal day-wear; however, unlike riding habit jackets, these garments were not considered outerwear. Another garment patterned after menswear, in this case the greatcoat, came into fashion for women in the late 1770s. Called a riding greatcoat or redingote, this garment was a floor-length coatdress with a fitted bodice and long, fitted sleeves. Many variations of this style were worn into the 1790s, some with the skirt attached only at the bodice back or to its sides, revealing a decorative petticoat in front. In spite of its name, the redingote was not intended for riding; it was an informal day dress that was also acceptable as outerwear for walking or traveling. At the end of the century, shawls, especially fine woolen examples imported from India, came into vogue as decorative indoor-outdoor accessories. Despite these innovations, capes persisted as the main outerwear garment for women, especially during very inclement weather. In the nineteenth century, rapid changes in women's dress determined whether capes, coats, jackets, or shawls were the fashionable outerwear choices at any given time. While capes continued to be worn throughout the century, shawls, coats, or jackets were sometimes more in vogue than the time-honored cape. This was especially true in the early nineteenth century when shawls and innovative jacket and coat styles predominated over capes. The most important new fashions were the spencer jacket, charmingly adapted from menswear for the narrow, high-waisted dresses of this period, and long over-coats, called pelisses, that mimicked the neoclassical silhouette of the dresses beneath. Capes resumed their former importance by 1830 because capes were more accommodating than jackets or coats over dresses whose sleeves had ballooned into the leg-of-mutton style. Even after sleeves deflated in the mid-1830s, capes, styled in a myriad of new designs, continued as the dominant women's outerwear garments for the next thirty years. Shawls were also popular for day-wear into the 1860s, especially large ones with paisley designs. Jackets again came into vogue in the 1850s and 1860s, including fashions with fur-trimmed, fitted bodices and knee-length full skirts for winter and short summer styles that flared out over hooped skirts. It was also in this period that fur garments with the fur on the outside, not as a lining, were introduced. Another jacket fashion, the dolman, was cut to accommodate the bustles of the 1870s and 1880s. Although not as popular as jackets, full-length coats were worn from the 1870s to the early 1890s, later losing favor to capes during the mid-1890s revival of the leg-of-mutton sleeve. Throughout the century, muffs and tippets, fur or fur-trimmed neck wraps, accessorized stylish outerwear. For men, the greatcoat continued as the most fashionable outerwear option until the 1840s. New styles appeared in mid-century, including the Inverness coat, a loose coat with an arm-length cape; and the paletot, a boxy, thigh-length jacket. From the 1830s to the 1890s, when men wore suits consisting of a skirted frock coat, a waistcoat, and trousers, the frock coat, although it was technically daywear, could also serve as outerwear except in severe weather. By the 1890s, the sack suit was replacing the frock suit for daywear and the sack suit jacket (the forerunner of modern men's suit jackets) was effective as lightweight outerwear. 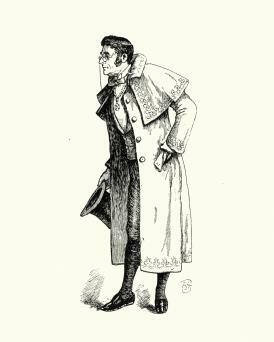 The winter overcoat of choice over both frock coats and sack suits was the Chesterfield, a topcoat cut similarly to a frock coat but longer, looser, and without a waist seam. Capes went out of style early in the century for daywear but endured as outerwear over formal evening wear. Wool or fur outerwear provided significant protection from the cold for centuries, but similarly effective protection from rain was only made possible by technological advances in the nineteenth century. In 1823, Charles Macintosh, a Scottish chemist, patented the first viable waterproof fabric, consisting of two pieces of wool cemented together by rubber dissolved in coal-tar naphtha. This invention had great potential but had the serious drawbacks of becoming stiff in cold weather and sticky in hot. These problems were resolved when vulcanized rubber was invented in 1839 and Macintosh produced the first practical raincoats; in England, Macintosh or "Mac" raincoats are still worn today. From the mid-nineteenth century to today, further technological developments have led to man-made materials with increasingly effective waterproof and heat-retention properties, such as vinyl rainwear and acrylic furs. Many forces shaped twentieth-century outerwear fashions. As in earlier centuries, the day and evening attire worn under the outerwear affected the look and cut of the overgarments, but sports, ethnic influences, the development of unisex styles, and new materials also played important roles. After centuries of predominance, capes were no longer the most ubiquitous outerwear garments. Men continued to wear capes for evening wear until mid-century, and women's capes were produced for both day and evening wear, but by the 1920s, capes constituted only a very minor part of the outerwear market. Throughout the century, the most basic outerwear options for both sexes were single- and double-breasted overcoats with notched collars. The men's versions often resembled their nineteenth-century precursors, while women had more diverse choices-coats fashioned in bright colors, new materials, and with contemporaneous style details such as padded shoulders. Primarily worn by women, twentieth-century fur outerwear had a checkered record. Fur was a luxury item in the early 1900s, but fur and fur-trimmed garments became more affordable by mid-century due to the mass marketing of cheaper furs. In the 1960s, there was a fad for "fun furs"-inexpensive pelts, made up into a variety of trendy jackets and coats. However, escalating labor and material costs, plus the concerns of animal-rights activists, led to price increases and lessened popularity of real fur garments by the 1990s. Fortunately, refinements in man-made furs have allowed fur to continue its longstanding role in outerwear fashion. The proliferation of new jacket styles for both sexes was the most significant outerwear development during the twentieth century. Whether ethnic-influenced anoraks and parkas, military-influenced pea and bomber jackets, or tailored blazers derived from men's suits, jackets are indispensable and versatile additions to everyone's outerwear wardrobe. See also Blazer; Coat; Duffle Coat; Jacket; Parka; Rainwear; Windbreaker. There are no definitive secondary sources focusing on outer-wear in all its forms. For a study of outerwear, general histories of dress plus histories of clothing in specific periods must be consulted. Some of the more helpful texts are included below. Ashelford, Jane. The Art of Dress: Clothes and Society, 1500-1914. London: The National Trust Enterprises Limited, 1996. History of fashionable dress in which outerwear is regularly mentioned and illustrated. Ashelford, Jane, ed. The Visual History of Costume: The Sixteenth Century. London: B.T. Batsford, Ltd., 1993. Boucher, Francois. 20,000 Years of Fashion: The History of Costume and Personal Adornment. New York: Harry N. Abrams, 1987. General history of costume in which outerwear garments are mentioned for each period from prehistory to 1947. Ewing, Elizabeth. Fur in Dress. London: B.T. Batsford, Ltd., 1981. Provides a good overview of fur and fur-trimmed outerwear from prehistoric times to the 1970s. The Visual History of Costume Series: The Nineteenth Century (Vanda Foster, 1984). London: B.T. Batsford, Ltd. Presents images with commentary on the clothing of the people in the pictures. Several images in each book depict outerwear.